The Irish Mathematical Society aims to further Mathematics and Mathematical research in Ireland. Its membership is international, but it mainly represents mathematicians in Universities and other third level institutes in Ireland. The Society publishes its bulletin twice per year (July and December approximately). 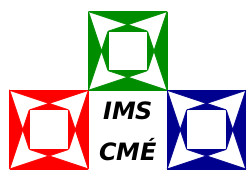 The IMS runs an annual conference in August/September, devoted to mathematical topics ranging from current research to educational issues. The Society has a sub-committee to discuss issues and formulate positions concerning Mathematics education. The sub-committee has produced a Short Guide to Second-level Maths. Reciprocity agreements are in place between the IMS and a number of other mathematical societies. The Society is a member of the European Mathematical Society. The Society provides financial assistance to the cost of running conferences and meetings of a mathematical nature, within its means. The Fergus Gaines Cup is awarded annually by the Society to the best performer in the Irish Mathematical Olympiad (IrMO). Created by Richard M. Timoney. Maintained by MM.